I am always weary about novels focusing on sick characters, but, when Simon and Schuster Canada sent me an egalley, I was intrigued! Five Feet Apart had the potential to have too many tropes (sicklit, brooding love interest, insta-love) to turn me off, but it all came together and worked for me. The strongest part of this novel is the characters. 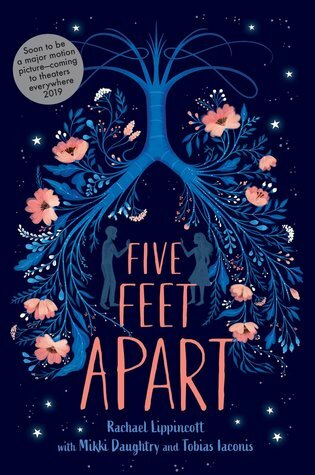 I instantly felt a connection to each and everyone of them, which made reading about their struggles with CF that much more difficult to read about. The relationship did feel a bit rushed, but, under the circumstances, it felt realistic. I really adored all of the side characters, who each had their own personalities and added to the charm of the story. I have seen some reviews saying that this is a The Fault in Our Stars wannabee, and I have to say that I disagree. I think it is natural to compare the two because they both deal with sick teenagers who fall in love, but that is where the similarities end in my opinion. Five Feet Apart follows two teenagers with CF who can not come within six feet of each other, which is difficult to do when you are falling in love. I thought it was powerful, moving, and heartbreaking. I would recommend Five Feet Apart, but be prepared and have a box of tissues at the ready. This is a book that you will not be able to put down, and will be sad when it ends. I love when I feel such a connection to characters in a novel! Thank you to Simon and Schuster Canada for sending me an eARC in exchange for an honest review. Definetly gonna read this one. Great review there! I’ve got this book on order but also requested on NetGalley, looking forward to reading it. Great review! Thank you! Can’t wait to see what you think. I am considering buying a finished copy because it is just such a beautiful book! Ooh I kind of do want to read this book. Glad you enjoyed it! It’s a good one! I would recommend for when you are in need of a good cry and a quick read. I love a book that can make me cry! Wonderful review Kristin! Thank you! I couldn’t even read through the tears at one point! Thank you! I am happy you enjoyed it as well! Intriguing! I was considering requesting this on NetGalley and you’ve definitely tempted me further! I definitely think you should request it! I flew through it and it made me very emotional.